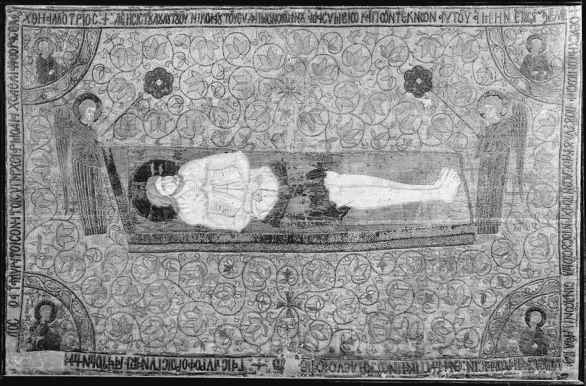 Figure 5.1 Epitaphios textile. Christ on a slab with angels with fans. Victoria and Albert Museum, London. in connection with various preliminary rites taking place in the naos, not with the Eucharist itself. By this time, icons had already taken their place in the templon or iconostasis, the barrier separating the naos from the apse and bema (i.e. sanctuary), and they faced the congregation directly. Earlier, in the eleventh century, the usual templon screen was closed at floor level by chancel slabs, but was still open above, with widely spaced columns supporting an epistyle. Originally curtains closed the spaces between the columns, to be replaced in the course of the twelfth century by large icon panels, so as to form an icon wall that blocked any view from the nave into the sanctuary.19 These iconostasis icons were of Christ, and the Virgin, and, frequently, the person or event to whom or to which the church was dedicated. The epistyle either was painted or carried a row of icons above it. On these epistyle icons the three figures of the Deesis might be joined by angels and apostles in what is known as the 'Great Deesis', or flanked by a row of feast icons depicting the primary events in the life of Christ and of his mother from the Annunciation to the Dormition (Koimesis) of the Virgin, repeating, on a smaller scale, and in a more concentrated form, feast images found elsewhere in the church. The functional difference between these iconostasis images and those of the main feast cycle is still not entirely clear. Entrance from the nave into the sanctuary was made through doors in the centre of the iconostasis, doors which often bore an image of the Annunciation (the closed door of Ezekiel 46:1-2 being interpreted as a reference to the Virgin and the mystery of the Incarnation). 19 See most recently S.E.J. 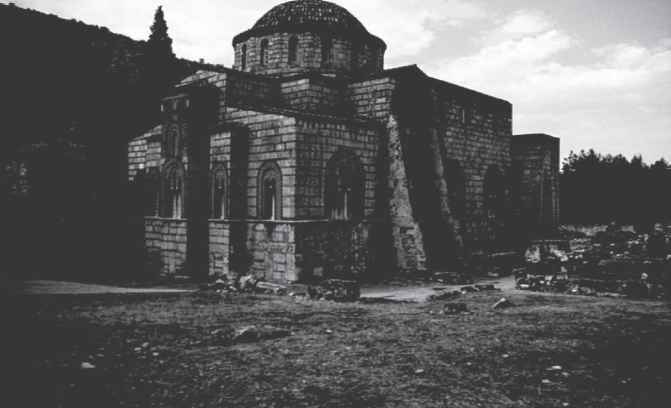 Gerstel, Beholding the sacred mysteries: programs of the Byzantine sanctuary [Monographs on the Fine Arts 56] (Seattle and London: University ofWashing-ton Press, 1999), 5-14 (although Patmos roll #719, cited ibid., 9 and dated by Dmitrievskij to the thirteenth century, is actually of the sixteenth or seventeenth century), and J.-M. Spieser, 'Le développement du templon et les images des Douze Fêtes', Bulletin de l'Institut Historique Belge de Rome 69 (1999), 131-64. 20 S. E. J. Gerstel, 'An alternate view of the late Byzantine sanctuary screen', in Thresholds of the sacred: architectural, art historical, liturgical and theological perspectives on religious screens, eastandwest, ed. S. E.J. Gerstel (Washington, DC: Dumbarton Oaks Center for Byzantine Studies, 2006). Norwich Jj Sitwell R. Mount Athos. 1966.